Posted byBrad Hepp September 12, 2012 September 16, 2012 Leave a comment on Why Did Constantine Become a Christian? 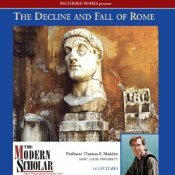 In the Audible Books Modern Scholars lecture series on The Decline and Fall of the Roman Empire, Thomas F. Madden takes on the question of whether or not Emperor Constantine’s conversion to Christianity was genuine. While this is in no way the main subject of the lectures, it is a fascinating question, especially in light of what followed on Constantine’s conversion: Christianity went from being an officially persecuted religion, embraced by 15% of the populace in 313 to being THE official religion of Rome, embraced by almost the entire Roman empire by the end of the fifth century. It forces one to ignore Constantine’s letters and the accounts of his contemporaries or assign them all to a massive conspiracy. It doesn’t make sense. Why convert to a religion that was at that time viewed as harmful to the empire? Why convert to a religion that refused to accept the imperial cult, which would have assigned deity to Constantine? People in high position delayed baptism until they were on their deathbed because of the view then that sins committed AFTER baptism might not be forgiven, thus ruining one’s chance of entering heaven. So, his delayed baptism was evidence that Constantine really believed that Christianity was a religion that affected his eternal state. Get baptized right away? This is really a reiteration of the point above: if his belief was merely feigned, he had no reason to delay baptism. Avoid baptism altogether? What political expediency could there have been for him in getting baptized on his deathbed?